Cruise ship passengers arriving at Harvest Caye offshore of Belize now have another great way to explore more of the country. A ferry now operates from Harvest Caye to the popular Placencia Village in southeastern Belize. Tickets can be purchased onboard cruise vessels or at the information booth on Harvest Caye for $20 USD round trip. 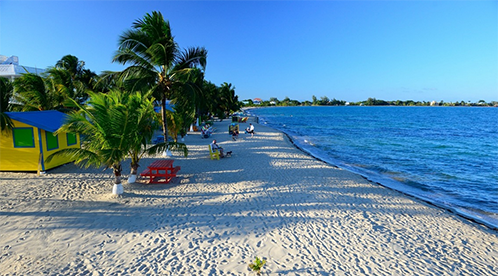 The Placencia Peninsula is a 16-mile long north-south stretch of golden sands on Caribbean shore in southeastern Belize. One of the leading eco-tourism centers in the country, Placencia Village (the “capital” of the peninsula) is a charming village with cafes, restaurants, shops, and dive centers for expeditions out to the nearby Belize Barrier Reef, a world-class destination for scuba diving, snorkeling, and fishing. Popular attractions in and around Placencia include hiking through the pristine vastness of the Cockscomb Basin Nature Reserve, home to all five of Central America’s big cat species, boat safaris on the aptly-named Monkey River, and exploring ancient Maya ruins like Nim Li Punit and Lubaantun. Other options include picnicking on the white sandy Placencia beaches, swimming in the sapphire waters of the Inland Blue Hole, zip lining and water repelling at Bocawina National Park. Placencia Village is listed in the Guinness Book of World Records for having the smallest main street in the world, actually a 1,000 foot-long pedestrian-only sidewalk that measures just four feet across. Despite its laid-back charm and “barefoot ready” motto, Placencia is home to some of the top festivals and events in the country, including the popular Lobsterfest in June, the Placencia Sidewalk Arts Festival in February, and the End of the World Marathon in December. The Placencia Peninsula is also home to a world-class casino and regularly hosts live music acts from all across the country and region. Barefoot Rentals and Services is a locally-owned and operated company based in Placencia. Whether you’re looking for a car, motorbike, golf cart, or scooter to get around Placencia and the area or want to partake in tours to all of the top destinations, Barefoot Rentals and Services can help. Barefoot can provide tips on the best places to visit and things to do and see as well as arrange for unique experiences like taking drumming classes and learning more about Belize’s many cultures. To make the most of your time in Placencia, contact Barefoot Services andRentals today.